“It’s a sweet surprise to me,” says Janet about living with Kathleen as home-mates. Kathleen and Janet were already friends. They met when Janet was Kathleen’s Episcopal priest, and Kathleen served on the vestry (a church board). Their friendship included vacationing together – Kathleen with her husband and son. After Janet had retired and moved away, Kathleen decided to leave her husband. (The son was grown and out of the house.) She called Janet and asked if she could “land” with Janet while she figured out what was next. Kathleen says, “Once I got there we started talking.” Janet was using the year as a sabbatical to figure out her next steps. After she decided she wanted to work part-time, she was offered a position that involved moving. She started looking at housing options. At first she looked at apartments, but didn’t like what she saw. Asked whether she moved her stuff with her, Kathleen laughs and says, “I’m at an age now, I’m over stuff.” When the move was official she did hire a mover and took her silver, dishes, art work, table settings and a few pieces of furniture. She didn’t need very much since Janet already had a full home. She says she’s often asked about how she managed this part, but it wasn’t difficult. They have a household bank account with debit cards that they both use. They split all costs. “Neither of us are bean counters by nature.” They are respectful and aware of how money is spent and it hasn’t been an issue. Janet gets up earlier than Kathleen and pushes the button to start the coffee. Kathleen sets up the coffee pot the night before. Janet feeds the animals in the morning, Kathleen does it in the evening. Most of the time they go out together. They have the same friends. They keep an electronic “family” calendar so that they don’t have conflicts. Kathleen says she once put an event in the wrong calendar and Janet ended up having to miss the event because she’s scheduled a meeting. “We backstop for each other,” says Kathleen. Janet for instance will remind her about needing an oil change on her car. Asked whether they’ve thought about the future, both women say yes. They have living wills and are each other’s health care proxies. With the house on one floor they are confident they’ll be able to stay there. They can afford to get help with snow removal, mowing, and similar tasks. Janet renovated her bathroom to have a walk-in shower. Here are two friends who fell into sharing housing and their home-mate relationship. I was glad to give them a word for the relationship – there are people around them who assume that they are a couple – but they are very clear that isn’t the case. They are home-mates. Like other older people sharing housing whom I’ve interviewed they had vacationed together. Spending time living together for a short period with a clear end is a one way to experiment with sharing housing. It’s not the only way – after all vacation is different from regular life. 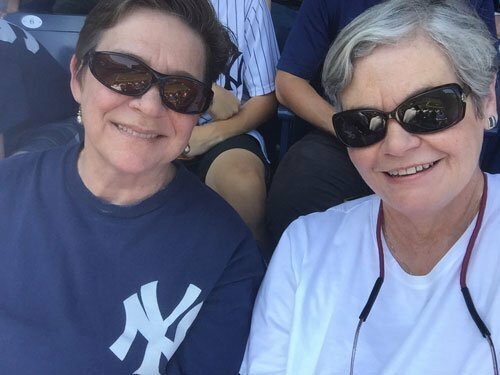 Kathleen and Janet discovered this way of living by being open to the possibility and then saying “Yes.” It’s clear they have all the advantages—saving on housing costs, companionship, help with tasks, and support for getting older and are having a great time. Here’s another interview of two friends who fell into sharing housing. Do you know other people living with friends who are home-mates? Do you have a friend or two with whom you could live?